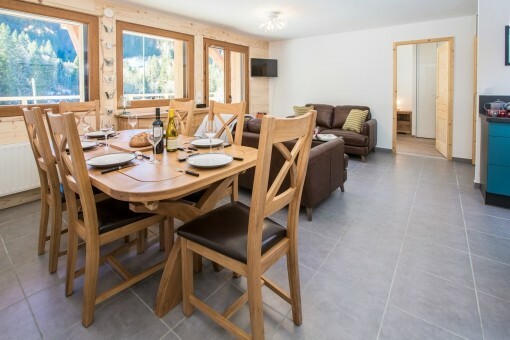 Completed in December 2017, Apartment la Source d’Aulps offers very light and spacious accommodation for up to 8 people. 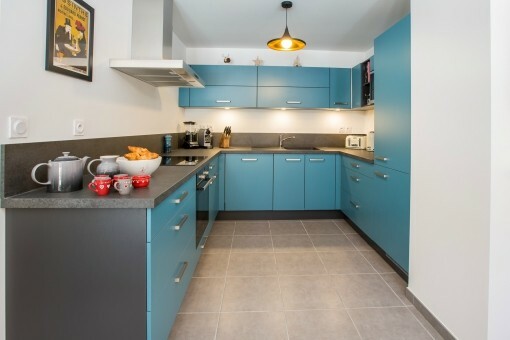 The apartment is located in a modern building complete with underground car park, ski lockers and entryphone. 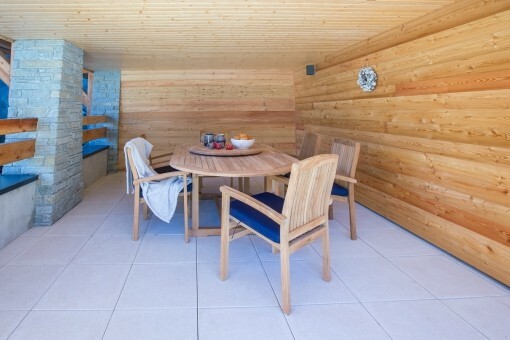 It is on the ground floor so benefits from having a huge south facing terrace at the front of the apartment. 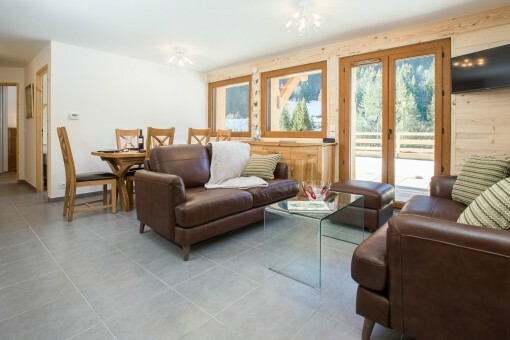 The open plan living area also has large windows offering uninterupted views of the mountains and the ski piste coming back to Nyon. Relax in the leather sofas at the end of the day and enjoy the view of the sun setting over the Pleney. The living area is also equipped with a Smart TV, complete with Netlix, English and French TV channels. There are also a selection of games and a Wifi speaker for music. 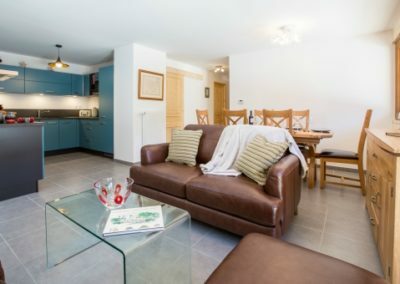 The modern kitchen is very well equipped and has everything you need for a self catered holiday including Nespresso machine, juicer and a slow cooker as well as the usual applicances. 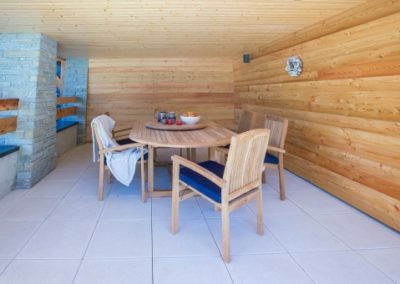 At the front of the apartment is the huge south facing terrace, which is a wonderful sun trap in the warmer months. Part of the terrace is under cover, offering a great area for outdoor dining. 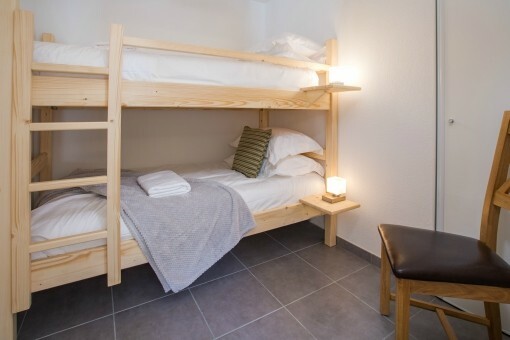 The two main bedrooms have been furnished with very comfortable ziplock beds, giving flexibility for groups wanting single beds. Bedroom 3 has a small double bed/large single and Bedroom 4 has bunkbeds. 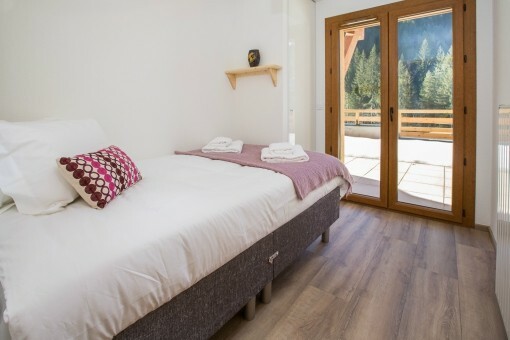 All the bedrooms have plenty of storage space, and the beds will be made up with fluffy duvets, pillows and good quality linen prior to your arrival. 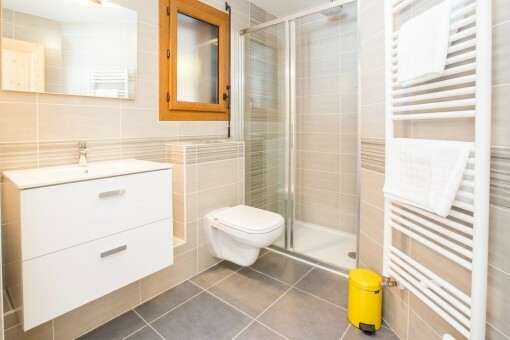 The apartment also has 3 bathrooms, 2 of which are ensuite shower rooms, and a large family bathroom which is shared by Bedrooms 3 & 4. Three of the bedrooms have double doors opening out onto the sun terrace at the front of the building. 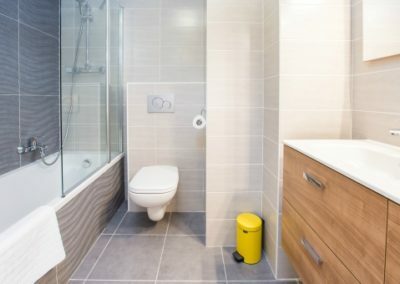 Double or twin beds with ensuite shower room. Double doors open onto the terrace. Double or twin bedroom with ensuite shower room. Double doors open onto the terrace. 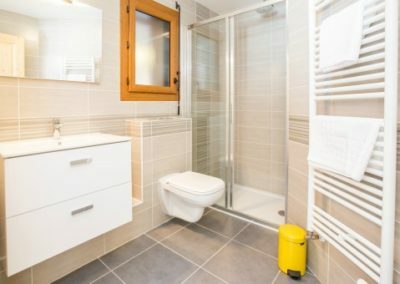 Small double room with double doors opening onto the terrace. 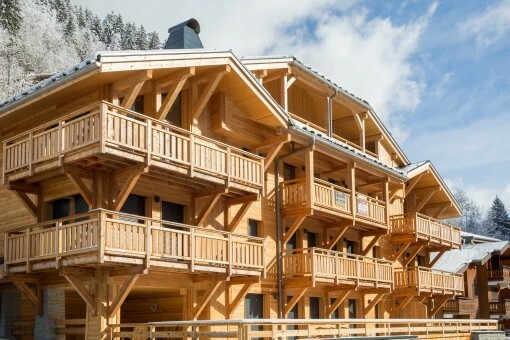 La Source d’Aulps is located in Nyon, which is on the edge of the village of Morzine. 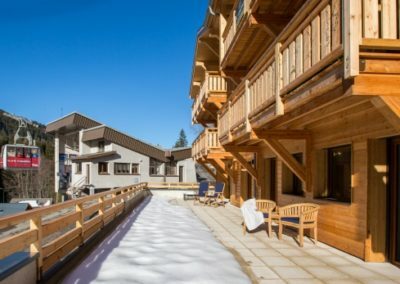 It is a perfect location for keen skiers, as it is literally steps away from the Nyon telecabine giving fast access into the heart of the Morzine/les Gets side of the circuit. For those with lessons on the Pleney slopes in Morzine, the free ski bus stops right outside the apartment. 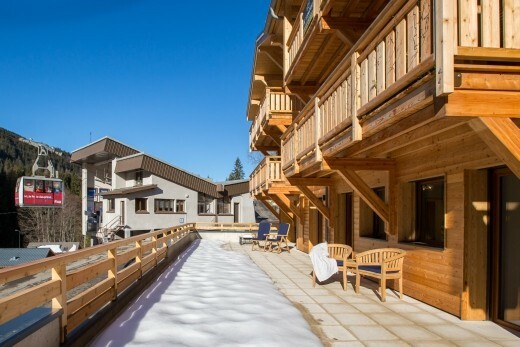 You can also return to the apartment on skis via the home run from Nyon, which stops within 100 metres of the building. 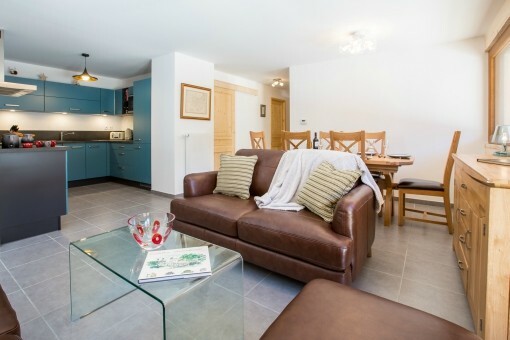 Please get in touch if you would like more information on any of our properties or if you would like to make a booking. 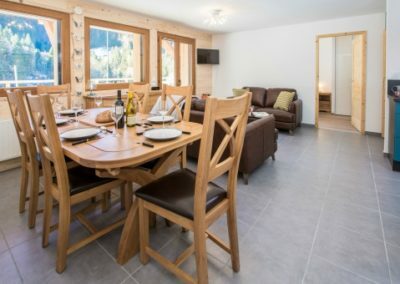 We offer the very best self catered ski chalets France, and aim to make your holiday as easy and relaxed as possible. Join our mailing list and never miss the latest deals, news and updates. Subscribe today to get Exclusive Offers & Discounts sent to your inbox. Join our mailing list and never miss the latest deals, news and updates from us at Chalet des Fleurs.